“As we Americans near our fraught midterm elections, these lessons are worth heeding. Pacific Repertory Theatre uses Vendini for ticketing, marketing, and box office management. A rare opportunity to see one of Shakespeare’s less commonly produced but strong character studies. 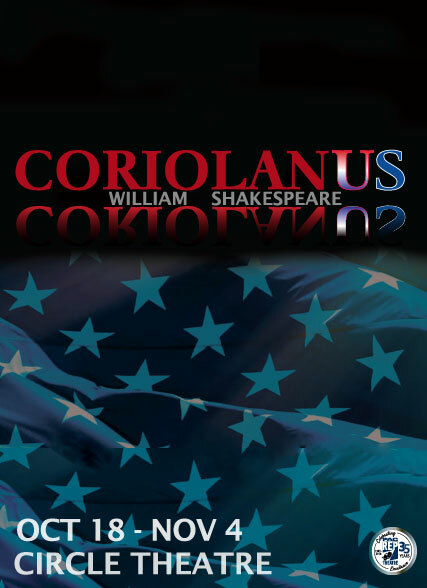 PacRep continues its exploration of Shakespeare’s Roman plays with a new and relevant adaptation of Coriolanus, a timely political piece that deals with the violent and messy beginnings of democracy, and a powerful commentary on class politics and the nature of patriotism. Here I will play Senator Menenius, friend of Coriolanus, who endeavors to guide him toward political mastery. This is a role that has been on my “wish-to-play list” for about forty years. I LEARNED SOMEWHERE on the internet that Bertolt Brecht was at work on his own version of Coriolanus but died before he could finish it. I was fascinated but not surprised. 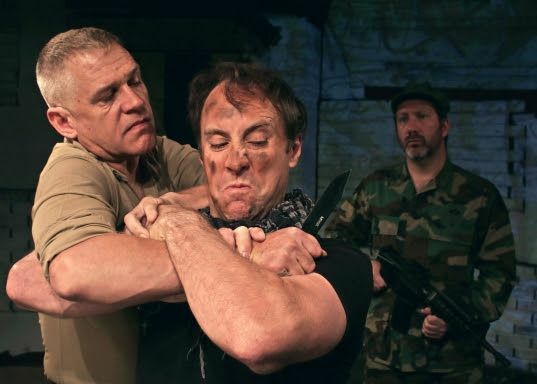 Kenneth Kelleher’s rousing new PacRep production at the Circle Theatre only deepens my conviction that of Shakespeare’s plays, Coriolanus is the most Brechtian. Which is to say it doesn’t offer fully rounded characters with accessible emotions and challenging attitudes. Instead it offers an artful portfolio of caricatures moving through a carefully crafted plot full of rash, one-track decisions ending in disaster. 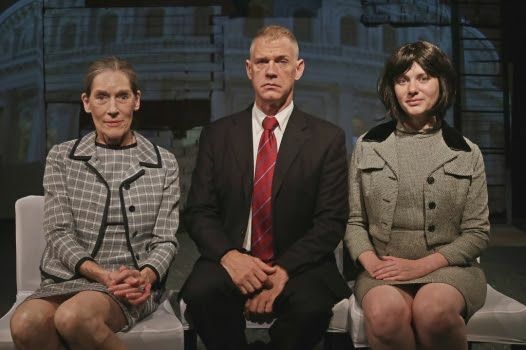 As in a Brecht acting company, these performers aren’t trying to win your sympathy, approval or support. They are illustrations of patterns of behavior we pay to watch and critically judge from a detached distance. This new Coriolanus is a loud and relentless example of Shakespeare writing at the top of his voice about a man obsessed with violence. The role is played with a terrifying raw power by Jonathan Rhys Williams. Forget the reflective wit and wisdom of Hamlet or the inner moral struggles of Macbeth. In this last of the tragedies, it’s all out in bold, plain sight with Caius Martius of Rome. Pathologically fearless in battle, he focuses on a single-minded beating down of every enemy, foreign or domestic. He doesn’t pause, evaluate or reconsider. It’s his way or nothing. Except for one brief plea for mercy on behalf of an enemy peasant who housed him during a battle, he shows little human sympathy for anyone and is totally lacking in humor. His spectacular military exploits in a Volscian city called Corioli earn him the proud political soubriquet ‘Coriolanus’ from the Roman Senate along with an invitation to run for the office of consul. But he is so incapable of political spin or crowd pleasing rhetoric that his venture into Roman politics snowballs into disaster and death. As with him, so with the one-track, sharp tongued horde of people who surround him. Kelleher’s brilliant direction keeps each of these single-motive interest groups placed where it’s easy to see who’s who and understand what it is they are each struggling to achieve. There are strong character contrasts but don’t look for subtle character development. It’s not that kind of show. The cast move with the patterned predictability of pieces in a game of chess. The single obsession in the heart of Coriolanus’ lifetime sworn enemy Tullus Aufidius is to destroy Coriolanus. Played by Will Springhorn, Jr. with voice and body language that closely mirror the icy blood lust of Williams’ Coriolanus, Aufidius, like Coriolanus, never recognizes the simple fact that he despises that other guy so deeply because the two of them are so frighteningly alike. In sharp contrast, there’s Coriolanus’ ingratiating father figure and polar opposite Menenius, played by Jeffrey T. Heyer with the practiced charm of an experienced Southern Senator (complete with Mason-Dixon accent) who seems at first to be a sincere peacemaker but whose public benevolence looks more and more like a carefully practiced political veneer as the evening progresses. That said, Heyer’s powerful explosion of hot rage when ultimately denied access to the exiled Coriolanus’ headquarters in Act 2 adds a layer of harsh realism that’s deliberately missing from most of the other carefully stylized performances. Coriolanus, of course, doesn’t come by all that towering aggression by accident. He’s been trained up from infanthood by his agate-hearted mother Volumnia. Acted with a lot of steely conviction by the wonderful Jessica Powell, this lady confides at one point to her daughter-in-law Virgilia (in a pleasantly feisty interpretation of the part by Elyse Sharp) that she’s always gotten a bigger thrill out of viewing a fighting man’s bleeding battle wounds than from anything anyone’s been able to do with her in bed. Howard Burnham is an earnest worrywart general named Cominius, who is generously over the moon when Coriolanus out-battles him in their fight against Volscian invaders but gets all knotted up with doubt and anxiety when his young colleague later launches an unwarranted military attack against his birthplace. Coriolanus’ political downfall stems from his being unable to sweet talk a rebellious mob of workers out of their rage at finding the government is hoarding grain while they go hungry. A couple of ambitious upwardly mobile tribunes named Sicinius Veluta (Julie Hughett) and Junius Brutus (D. Scott McQuiston) take up the populist revolt, not because they care about workers’ rights but because it gives a temporary boost to their determination to destroy Coriolanus. JUST IN time for the mid-term elections, PacRep Theatre serves up a commentary on contemporary politics with William Shakespeare’s “Coriolanus,” which plays at the Circle Theatre through Nov. 4.
follows the rise of a Roman general whose courage and success open up political opportunities. But he finds the political arena more treacherous than the battlefield, and he is banished from Rome for voicing “undemocratic” ideas. But he soon returns with an army at his back and vengeance on his mind. Instead of ancient Rome, PacRep sets the play in America in the 21st century. “This powerful commentary on class politics and the nature of patriotism is a timely political piece that deals with the violent and messy beginnings of democracy of that time,” PacRep executive director Stephen Moorer told The Pine Cone. Directed by Ken Kelleher, the play stars Johnathan Rhys Williams as general-turned-politician Caius Martius Coriolanus. The cast also includes Jessica Powell, William Springhorn Jr., Nina Capriola, Joseph Cardinale, Jeffrey T. Heyer, Elyse Sharp and others. The play continues Thursdays, Fridays, Saturdays and Sundays. All shows start at 7:30 p.m. except Sunday matinees, which begin at 2 p.m. Tickets are $8 to $38, with discounts available for children, students, teachers, seniors and active military. The Circle Theatre is located on Casanova between Eighth and Ninth. Call (831) 622-0100 or visit wwwpacrep.org. 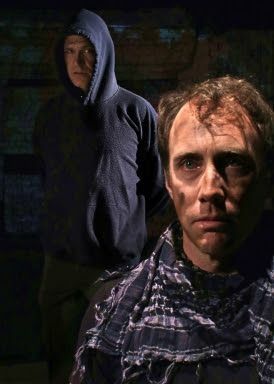 “Coriolanus,” which plays at the Circle Theatre through Nov. 4. Equity actor Johnathan Rhys Williams plays the title role in “Coriolanus,” a Pac Rep production.